Until the Miami Youth Economic Development Conference!!! 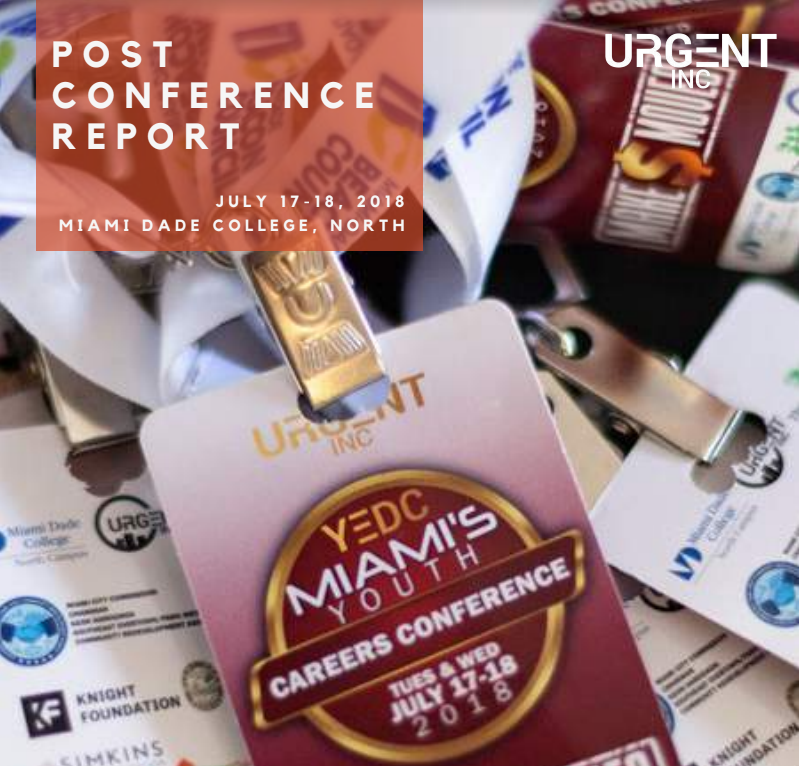 YEDC is Urgent, Inc.’s Youth Economic Development Conference, Miami’s premier careers conference for youth. Thanks to our partners Miami Dade College, North Campus, The Children’s Trust and Miami Dade County Public Schools we can bring this high-energy, motivational, and educational 2-Day experience to over 500 youth. This year’s theme Make Money Moves refers to the potential of all youth to prepare for their economic futures and be transformative change agents in their communities. As ever, the challenge is to help youth create viable economic futures, work towards meaningful careers and play a vital role in the future of Miami’s workforce and business community. Over 2-Days, youth will exchange, learn, connect and collaborate with successful professionals, entrepreneurs, educators and talented youth! From key note speakers, hands on-workshops, career exploration experiences, to college and career planning, financial literacy and personal development sessions, there is never a dull moment at YEDC. Featured conference events include, a business pitch competition, Miami 4 Social Change Youth Film Festival and Business Vendor Fair. Urgent, Inc. invites teen camps, college and high school summer interns, and youth leaders to attend. The event is free for youth ages 14-21, adults and chaperones are $25/day. Urgent, Inc. cordially invites teen programs, high school summer interns, youth groups, and youth leaders to join us for this exciting youth conference! YEDC is Miami’s premier youth career exploration conference. For the fifth year, Urgent, Inc. presents the annual Youth Economic Development Conference & Expo in partnership with Miami Dade College, North Campus. JULY 16, 2019 WELCOME TO DAY 1! JULY 17, 2019 WELCOME TO DAY 2! Est. 1994. URGENT, Inc. is a 501 (c) (3) Miami, FL based youth and community development organization dedicated to empowering young minds to transform their communities. Guided by the principles of innovation, growth and transformation URGENT sees young people as the drivers of change and works to provide empowering opportunities to create the next generation of social change agents. Rising out of the ashes of the 80’s riots and the depressed urban economy of the 90’s, Urban Renewal Greater Enhancement National Team (URGENT) was founded in 1994 by a small group of concerned residents who wanted to see change in Miami’s urban core. Now a youth and community development corporation, URGENT celebrates 23 years of service to the Miami! This website was a result of working with Urgent, Inc. Film Arts Culture Coding Entrepreneurship (FACE) Summer Employment Training Program in collaboration with TechLaunch at FVI with the support of The Children’s Trust, Southeast Overtown Park West Community Redevelopment Agency and Career Source South Florida.